If we’re having soup for dinner, it has to be hearty. This lentil sausage soup is just that. 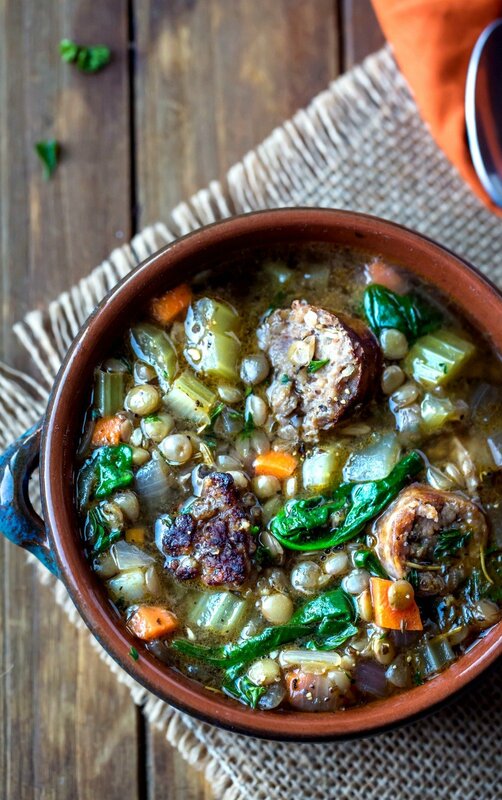 It has pieces of Italian sausage, lots of veggies, and plenty of green lentils. Which color of lentils are the best? Let’s talk about lentils. The most common types of lentils sold in the U.S. are brown, red, and green lentils. Brown lentils are the most common variety, and they are usually sold in the bags that are labeled “lentils”. They are the mildest flavor-wise. Red lentils are slightly sweeter, and they are commonly used in Indian food. So, why is it important to use green lentils in this soup? Red lentils cook more quickly than brown or green lentils, and they would end up mushy with the extended cooking time. 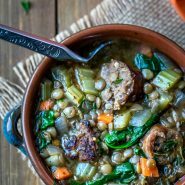 Green lentils have more flavor than brown lentils, and they give this lentil sausage soup a unique flavor. They are slightly more expensive than brown lentils (at my local supermarket, they’re just under $2 for a 1 pound bag), but they’re really tasty and worth the little extra. If you’ve tried this lentil sausage soup recipe, don’t forget to rate the recipe and leave me a comment below. I love to hear from people who’ve made my recipes! You can SUBSCRIBE to receive my latest recipe newsletters or FOLLOW ME on FACEBOOK, INSTAGRAM and PINTEREST for even more delicious food. 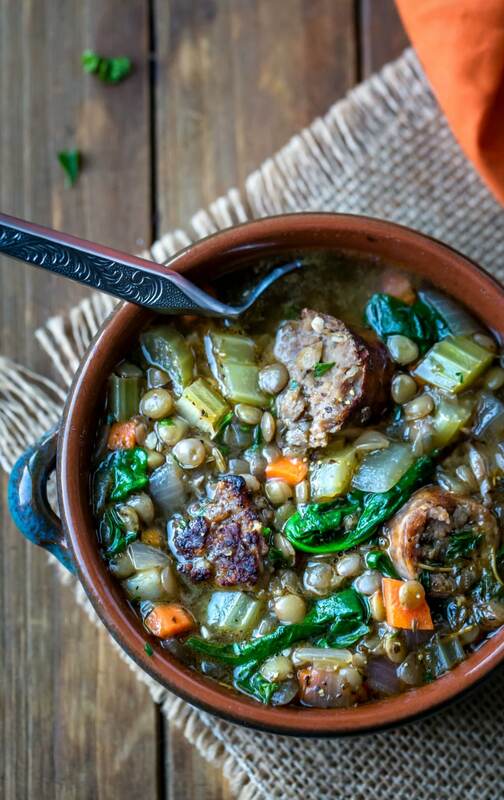 Lentil sausage soup is a hearty, healthy soup recipe that's made with French green lentils, plenty of veggies, and Italian sausage. Rinse the lentils; put them in a large saucepan with about 3 cups of water and the bay leaves. Bring to a boil, then reduce to a simmer and cook for 15 minutes. Meanwhile, heat oil in a large Dutch oven. I used a 5 quart, and it was just over half full. Add the sausage and brown, stirring frequently. Remove the sausage to a cutting board and cut into 1/4-inch-thick slices. Return sausage slices to the pan, and brown sides. Add the onions and garlic to the now-empty pot, and season with salt. Cook onions and garlic over medium heat, stirring regularly, until the onions have softened. Stir in the celery and herbs de provence. Add the wine, and let it cook down until reduced by half. Stir in the lentils with their cooking water, broth, sliced sausage, and carrots. Bring to a boil, and then reduce the heat. Simmer until the lentils are tender about, 30-45 minutes. Stir in spinach and parsley, and simmer for five minutes. Yum! This soup is really good! Bread and a salad make this a good meal.